The game was close, the level of competition was high, all it took was one pivotal play, just like Al Pacino said it came down to inches . First things first, I want to give a huge THANK You to my friend and assistant coach Damian Adamczak, without his help this article wouldn't be written. When AFVD replied that Touchdown-Europe.net won’t be granted two media passes I was like, are You kidding me ? What is more I’ve been informed that Damian had to pay for his ticket! I understand the amount of requests, but we all know that there’s too much politics in European American Football and this is one example. On the other side there were a lot of positive things and I will give to Kaiser what belong to Kaiser. In the morning we’ve attended the Hudl clinic – I’ve heard about this software, but I didn’t know its capabilities. I’ll write about in a separate story but “this way of the future” thing is pretty impressive. 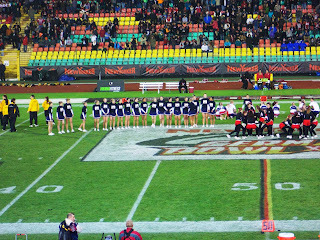 When we got to the stadium , we’ve found cheerleaders warming up and flag football games being played on the surrounding fields, it were also national finals. I must give a big thumb up for the AFVD for those “football starters”. 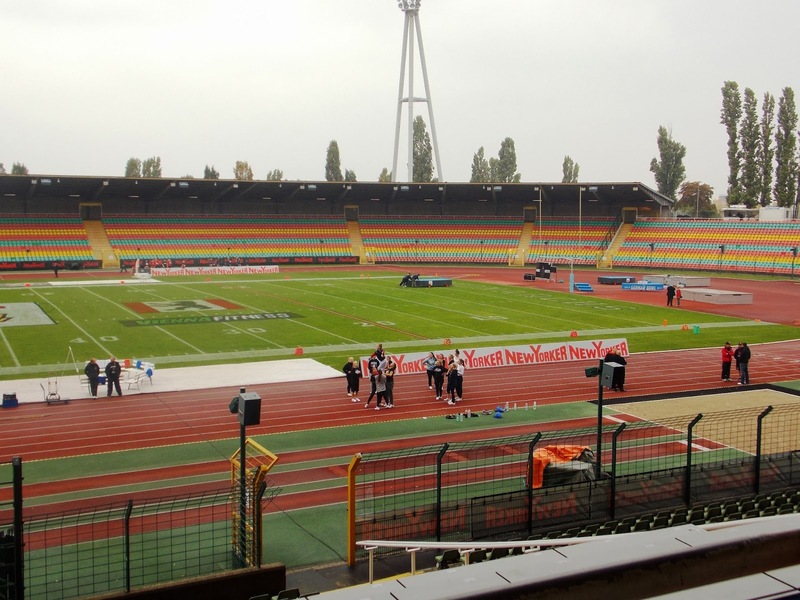 The venue – F.-L. Jahn Sportpark isn’t the newest sports facility, yet in my opinion there is no pressure to organize it in Olympia Stadium. 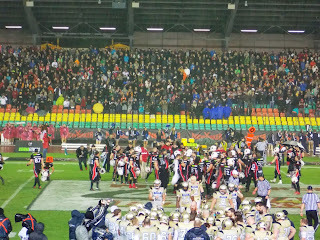 Football is established in Germany and you can draw a large number of spectators according post game stats apx. 12 200 for the game itself. So after this long introduction let’s get back to the game. Monarchs drew the first blood with Trevar Deed’s first rushing TD of the day. InDeed they trusted indeed he was responsible for Monarchs 328 all-purpose yds 289 on offense. The extra point was no good and Dresden lead 6-0. Lions responded with the aerial assault led by american QB Casey Therriault, the problems came on the 1 yd line, where his two sneaks were stooped. After TimeOut Lions faked run to the right and Therriault scored TD on a Payton Manning naked bootleg. The rest of the first half was a constant battle of the offenses. Each drive resulted in a score yet, two times Monarchs had to settle for a FG. Hilgenfeldt booted it through the uprights from 23 and 39 yds, with 8 seconds in the half. In my opinion Dresden could have taken one shot at the end zone, yet at the post game presser HC Gary Spielbuehler admitted that they didn’t have any timeouts left. New Yorker responded with a TD passes to wideout #84 Niklas Romer and TE #81 Tommi Pinta- 100% reason to remember the name! (Actually I wasn’t sure if it wasn’t Dennis Pitta of Ravens) He was in absolute Beastmode, listed at 202 cm and 120 kg of pure muscles, caught 9 balls for 157 yds and 1 TD. Yet those numbers don’t tell It all- he was making the Crucial Catches ( OCTOBER wear pink) that moved chains to kept the Lions drives alive . 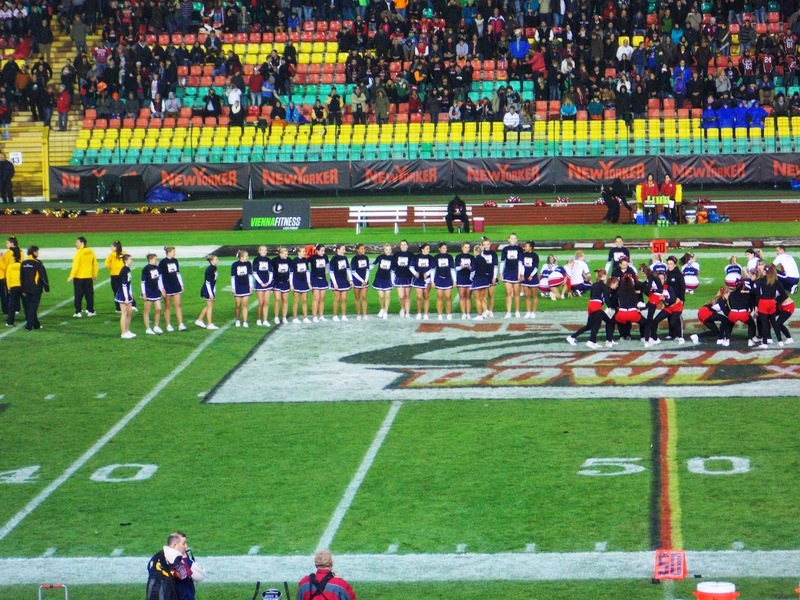 At the half the *Res*en Monarchs were trailing 19-21, mainly due to the lack of the D.
Halftime show was a showcase of GFL Cheerleading talent - this is also a great idea that more the merrier – you had not only squads for Lions and Monarchs present. Then it started to rain and the offensive production was shut down- the defensive units dominated third quarter. Firstly, Lions gamble on 4th down wasn’t successful, then teams exchanged punts – the only two of the day. Finally, Dresden was able to put a nice drive, which culminated in Deed galloping for a 7yd TD run. After third Dresden was up 26-21. The final quarter was opened by a 5 play 64 drive of the NewYorker side. Pascal Maier caught a 33yd deep bomb in a heavy traffic- he had at least 3 defenders around him! Lions up 28-26. Dresden responded with series of their own, mix of runs by Deed and passes by Jeff Welsh was finished by Emmanuel Moody’s short TD run, 2point conversion pass was good and at that point Monarchs were leading 34-28. Lions were starting at own 26, Therriault took care of the business, either he run with the ball or connected with his receivers. Pinta caught two balls for 44 yds and was the safety blanket, while his QB run for his second TD of the day. Lions were up 35-34. 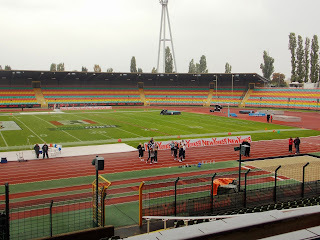 There were still about 3:30 to play in the game when Dresden lined up to return the kick-off, the rain was now resembling the “Patriots-Bengals 4th quarter drizzle”. Then the bad things started to happen, the kick bounced of Deed’s facemask, but was recovered somehow by Krueger. Monarchs Personal foul backed them to their 25 yd line. The go to guy tried got things reDee(m)d, on 4 carries he took his team 40 yds to Lions 35 yd line. After a no gain run by Moody on 2nd down at :58 timeout was called by the offense . Five yards to go, championship on the line, everyone in the stadium knew, that was the ballgame. Handoff to Deed, he runs off left tackle, gains 10 yds and then just like that …fumbles… the ball is picked off by Nelson Mokwema, who gets out of bounds. What would have been a game winning chips hot FG for one team, turns into victory formation for the other. The sky above is crying with tears of sorrow for the Dresden and tear of joy for Baraunschweig. 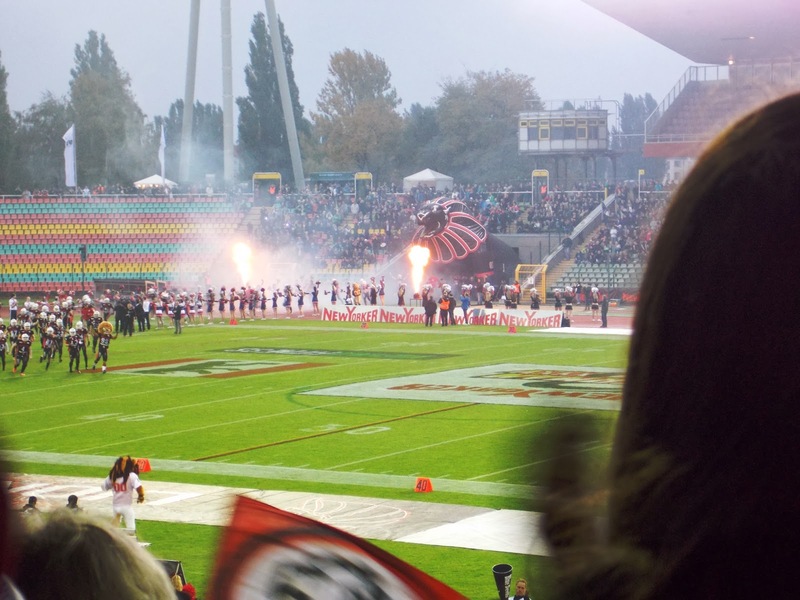 To make it even more surreal, The German Bowl XXXV palyed in Berlin was concluding with a Thunderstorm in the middle of October. “God’s will” said one of the Monarch faithful with tears in his eyes, I could feel the guy’s emotions, but all I could say was the “you have fought hard “ cliché. Damian made the point, that you could feel and hear how much they were into the game. The Lions were rejoicing with their supporters and mother nature provided a natural Gatorade shower. At the post game presser Monarchs HC Gary Spielbuehler pointed that his team played a great game, and things like fumbles will always happen. Troy Tomlin of Lions also complemented his opponents . 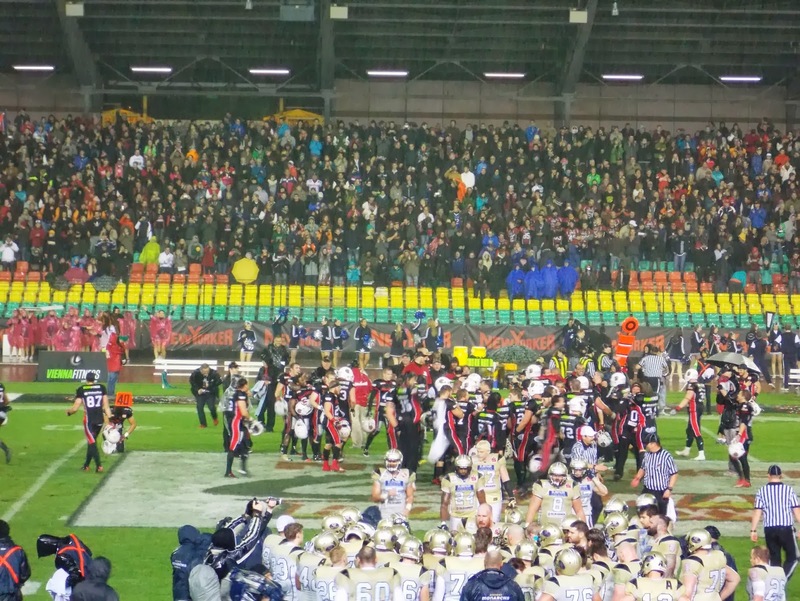 The AFVD President Robert Huber was content with the organization of the event, the attendance and the quality of the game .When I asked him about the IFAF Club competition he replied that no German team will take part in this funny event- but I guess that’s a topic for a different discussion . To conclude despite the Media Pass issue, I have positive comments about the game. It was close and came down to the final gun- so the drama was there . 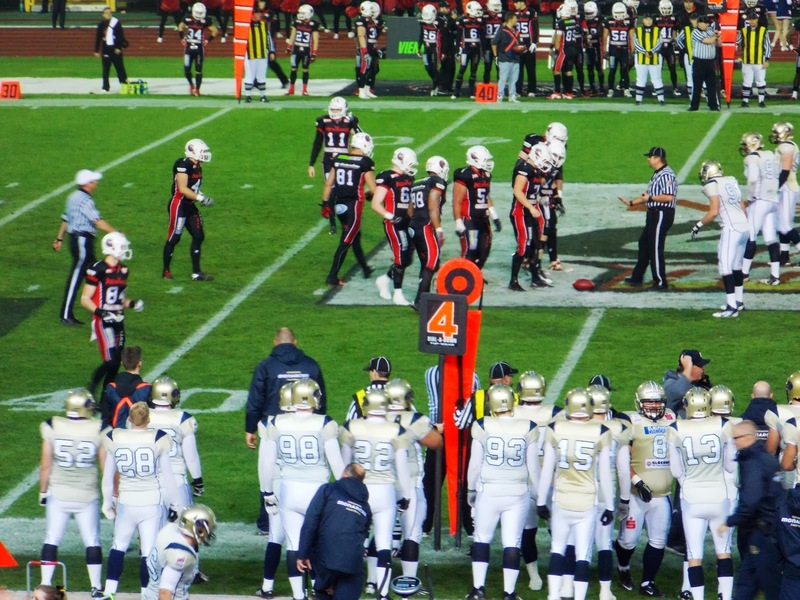 A lot of readers may ask how does the GermanBowl XXXV be compared with PLFA SuperFinal VIII. Let me put it this way – (not an expert on relationships but at 2 am that’s the best comparison I can think of )- there is a different level excitement and involvement when organizing your 8 and 18 wedding anniversary- you get the point? I enjoyed the game, the atmosphere, the surrounding event just one more comment if GFL want to organize GemanBowl in October that’s fine with me just make sure that the weather is good – that will be the true power of german engineering . And with Giants at 0-6 and Jets 3-2 at least for this weekend it’s official the Lions are best New York’s football franchise. I'm including few great pictures taken by Damian during the game.